Top Ten Countries with Largest Muslim Population is based on the total Muslim population in a country. Top countries include Indonesia, Pakistan, and India. 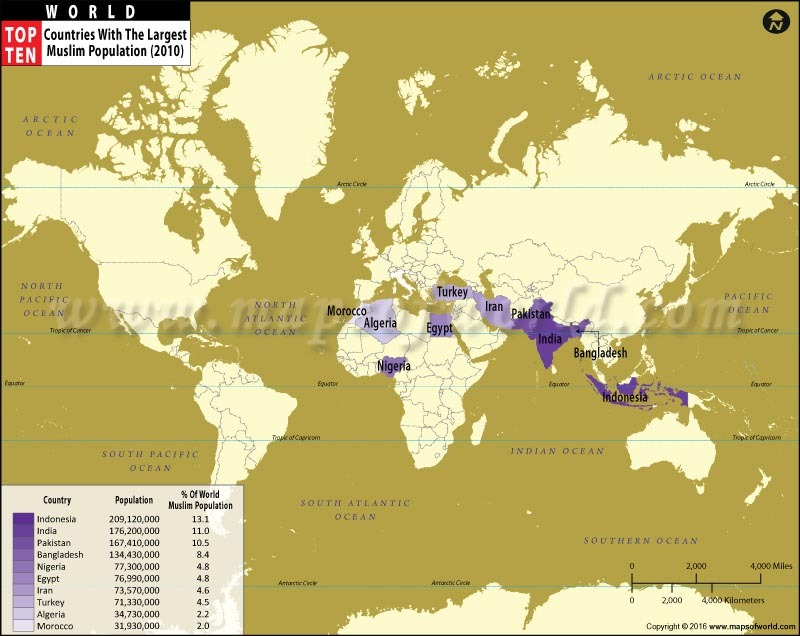 With about 88% of Muslim population, Indonesia is the most populous Muslim country in the world. Regions such as Java, Sumatra, West Nusa Tenggara, and Sulawesi have significant majority of Muslims. As of 2016, the country constitutes more than 13 percent of the world's Muslim population. Being the second largest religion in India, Muslims make up 14.2% population of the country or at least 176 million adherents. Influence of Islam is visible in architecture, culture, cuisine, and politics of India. Islam is the state religion and the largest religion of Pakistan, with an overwhelming majority of up to 97% of Pakistan's population. Sunni group make up the 75-85% of the Muslims while the Shias and Ahmadis form between 10-25% and 2% of the population respectively. With roughly 150.0 million followers, Muslims form 92. % of Bangladesh's population. The constitution refers Bangladesh as a secular state, however the United Nations has recognized the Asian country as moderate Muslim democratic nation. Africa's most populated country, Nigeria has one of the largest Muslim populations in West Africa. Islam is the dominant religion and the state religion in Egypt with around 90% of the population identifies as Muslim. Known as a stronghold of the Shi'a Muslim faith, the country has more than 99% of Muslim population. More than 97.8% of Turkey's population identifies as adherents of Islam. Besides the majority of Sunnis, there are some other branch of Islam reside in significant numbers including Shias, Alevis, Alawites, and Sufis. Islam is the majority religion in Algeria – the largest country in Africa by area. Islam provides an overall social & cultural identity of Algeria. Like Algeria, majority of Sunni Muslims in Morocco follow Maliki school of jurisprudence. Islam, with 99% population, is the largest religion in Morocco. As a secular state, Indonesia has Islam as its dominant religion. Indonesian Muslims mainly follow the Shafi'i school of Sunni jurisprudence. Islam is the state religion of the Islamic Republic of Pakistan. Called as the “global center for political Islam”, Pakistan has the world's third largest Shia population after Iran and India. With Cheraman Juma Masjid In Kerala as the first mosque in India, the country had Mappilas in Malabar as the first community to have converted to Islam. Islam is the largest religion of Bangladesh. The United Nations has identified Bangladesh as moderate Muslim democratic country with a majority of Muslims being Sunni. Egypt has Islam as its dominant religion with almost the entirety of Egypt's Muslims as Sunnis in addition to a small minority of Shia and Ahmadi Muslims. A majority of Muslims residing in Nigeria are Sunnis. The religion of Islam was first documented in Nigeria in the 9th century. Islam has been the official religion of Iran since the Islamic conquest of Persia. 90-95% of the Iranians are Shia's and 5-10% are Sunni. The presence of Islam in Turkey dates back to latter half of the 11th century. 97.8% population identifies as Muslim and only 2% is non-religious. A vast majority of Muslims in Algeria are Sunni Muslims belonging to Maliki School of jurisprudence, in addition to a small minority of Ibadi, Shia and Ahmadi Muslims. With more than 99% of the population adhering to Islam, it has become the largest religion in Morocco. A huge majority of Muslims in Morocco are Sunni Muslims belonging to the Maliki School of jurisprudence.